Photos by Jenny Neyman, Redoubt Reporter. Dr. Alan Boraas, professor of anthropology at Kenai Peninsula College, leads a tour of Kalifornsky Village last month. The Native settlement was abandoned in the 1920s but is still home to a rich cultural history. These days, there isn’t much to see of Kalifornsky Village. An unmarked footpath leads away from Kalifornsky Beach Road into the woods, single-file and nondescript. You wouldn’t know it was there unless you knew it was there. Dead trees and undergrowth have been cleared recently along the muddy path winding toward the bluff overlooking Cook Inlet, affording a clearer view of more branches and tree trunks, sprouting among indentations in the undulating ground. The structures have long since been dismantled or disintegrated, and the Dena’ina Natives who once lived here were the original “leave no trace” campers, considering it bad form to leave much of anything behind. Farther along, near the slowly, steadily eroding bluff, there’s two obvious indications of human habitation, or, at least, expiration — a hand-hewn, falling-down fence ringing a cemetery that contains 16 graves, with another just outside, the paint flaking off the whitewashed Russian Orthodox crosses with their telltale slanted bars. Just beyond it, closer to the bluff, is another fence, surrounding the site of an old Russian Orthodox chapel. But who had lived here? Who had died here? Who is buried here? There is no explanation as far as the untrained eye can see. But on April 15, there was plenty of history for the ears to hear and the mind to ponder. 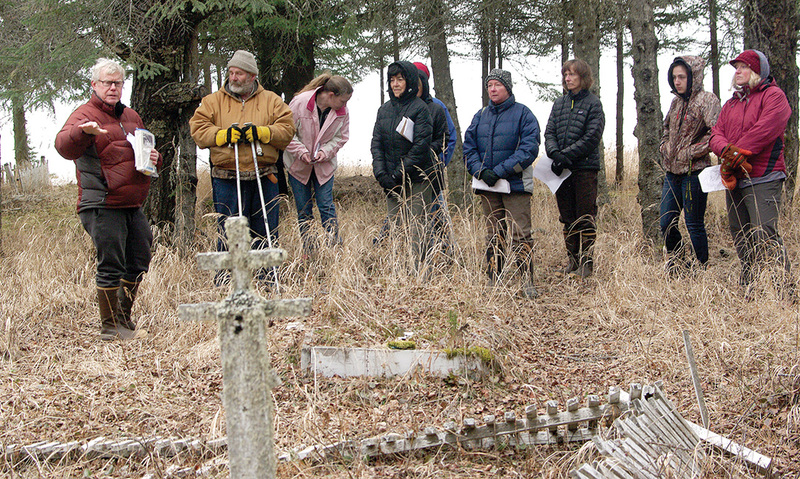 A group of about 15 joined Kenai Peninsula College anthropology professor Alan Boraas on a tour of Kalifornsky Village, to get a sense, through senses beyond just sight, of what is so special about the place. Kalifornsky Village, or Unhghenesditnu, meaning “farthest creek over” in Dena’ina, was founded by Qadanachen Kalifornsky in about 1820 on the Cook Inlet bluff four miles north of the Kasilof River mouth. Qadanachen had just returned from working at Fort Ross, about 100 miles north of San Francisco, built by the Russian American Company to grow grain to feed Russian colonies. The grain was a bust, rotted by the damp climate. Qadanachen’s heart was likewise deteriorating, from sadness at being away from home. He had brought a bag of soil from his home village of Ski’tuk at the mouth of the Kenai River, which gave him some comfort of connection. He wrote a song about his homesickness. “‘Another dark night has come over me, we may never return to our home, but do your best in life, that is what I do.’ When your break down the third line, ‘do your best in life,’ it could easily be translated as, ‘live to enhance your soul.’ ‘Another dark night’ — we all have them, and will have them. Do what you can to live to enhance your soul,” Boraas said. When Qadanachen returned home, he found disputes in the Kenai village and decided to establish a new village with his clanspeople, choosing an old village site dating back to prehistoric times. Dena’ina thrived here long before European explorers came to Alaska, living in multifamily log houses, called nichił, which were partially dug into the ground, with a hearth in a large room for sleeping, warming and cooking, and smaller rooms along the sides. Scattered around in the woods were food cache pits, in which Dena’ina would preserve the summer catch of salmon to sustain them through the winter. In the second occupation of Kalifornsky Village, they built new houses and planted gardens. And there was a log Russian Orthodox chapel, where a priest from Kenai would visit periodically to tend to the spiritual needs of the villagers. Dena’ina spirituality and the imported Russian Orthodox religion were an amicable fit. “Spirits and angels, powers of place, powers of ritual — all of these things would have been common, and just as many Dena’ina and Yup’ik today do not see serious conflict between the orthodoxy that they practice and the traditional ways,” Boraas said. The Soldotna City Council has a lot of questions regarding the possibility of annexing land to expand its cramped, 7.5-mile footprint — What areas would be appropriate to consider? What would be the costs versus the benefits? And how to go about it? Twenty-six people testifying at its meeting May 13 were happy to provide answers — Not their neighborhoods, the cost would be public outrage, and the city shouldn’t go about it at all. “Tonight you have the opportunity to exercise democracy in action. Do the right thing and put a stop to this once and for all. None of us want to continue to experience the cost emotionally or financially that will occur if this continues,” said Brian Olson, president of Borough Residents Against Annexation. The group showed up in force Wednesday to urge the council not to pass an ordinance that would appropriate up to $150,000 to study the economic, social and logistical implications of annexation. Of the 28 people who testified, only two — Soldotna resident Penny Vadla and daughter, Kaitlin Vadla, were even notionally open to the idea of annexation. The rest expressed their vehement opposition in a variety of ways. From touch of local humor, with a resident of the River Hills Subdivision off Ciechanski Road suggesting spending the money proposed to study annexation on studying to remove the new roundabouts on Binkley Street. “Don’t force nobody in. That’s what the communist people does, they force you to do stuff,” said Fred Sturman. Liberty, freedom and America were buzzwords of the night. “You plan to take my liberty away for economic growth,” said Martin Hall, who lives on Lonesome Street. “If they want to land a plane on the lake out front at four in the morning, I don’t care. To me, that’s the sound of liberty,” said Mike Denison, of East Lake Avenue. “This is still America and we should still have freedoms and the right to choose where we live,” said Daniel Lynch, of Soldotna. “I didn’t vote for you. You don’t represent me. You have interest for people who live in the city, but not me. There’s something fundamentally un-American about the fact that you can have annexation without representation,” said Faith Hall, who lives in the Echo Lake area. Photos by Clark Fair. 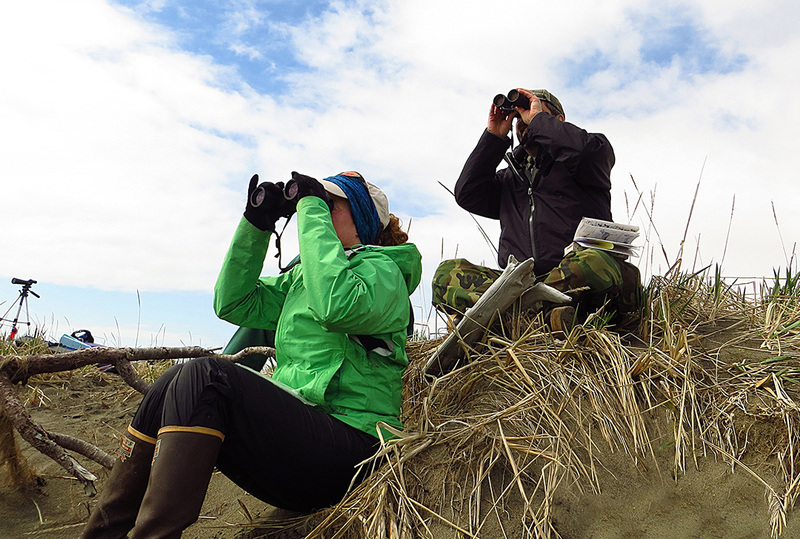 Yvonne Leutwyler and Nathan Coutsoubos watch seabirds on a University of Alaska “Birds of Alaska” trip to Cape Constantine near Dillingham recently. It may be unfair of me to say, but, as of now, I find trying to learn the identities of birds by their songs disturbingly akin to trying to learn French in college by closing my textbook and just listening to my instructor. I’m trying, damn it, but it’s hard. And I don’t want to give up, as I did with French. In the 1980s at the University of Montana, after two and a half years of German and one year of Spanish — two languages that sound the way they look — I decided to tackle French. In the first class, our instructor told us to put away our “livre de langue française” and simply listen. At that point, she ceased speaking English and spoke only French. She pointed to herself and said, “Professeur.” We dutifully echoed her word. Then: “Bonjour, classe!” That was an easy one. We responded with a chorus of, “Bonjour, professeur!” But each subsequent sentence or expression grew increasingly complex, and the more visual learners among us became increasingly perplexed learners. I dropped the class after only one term. I realize, of course, the near necessity of learning the musicality of birds, particularly the LBBs (“little brown birds”) that frequent the forests and tundra and waterways of Alaska. To begin with, with the exception of robins and thrushes, most of the LBBs have a body the size of a golf ball, so they’re tough to see well unless the light is perfect or they happen to land on a branch next to one’s face. They also don’t stand still long — they dart, they flit and they zip. The moment I’d raise my binoculars for a closer view, they’d be gone. They also prefer deep cover — the branches of spruce trees, for instance, or tall grass or thick brush — so their sounds can appear directionless, almost coming out of nowhere. So learning birdsongs is the best alternative. If one can learn their individual tunes, one can nail down the species — even if, like the French words in my textbook I wasn’t allowed to use, one never sees the actual bird at all. HOWEVER, confounding the whole process is the fact that nobody seems to have informed these LBBs that it’s not polite for all of them to talk at the same time. 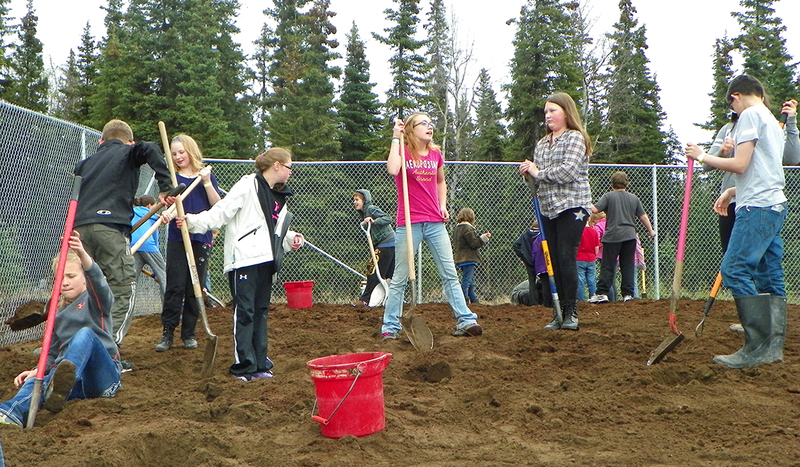 Photos by Jenny Neyman, ,Redoubt Reporter. Skilak Lake Road has been closed since Thursday. The lower section of road, miles 19 to 8.5, was reopened to four-wheel-drive vehicles Tuesday, though RV and trailer traffic still is not allowed. Alaska in the springtime is a sloppy situation. Best-case scenario, breakup mud is shallow, short-lived and segregated to soggy spots away from where anyone walks or drives. Skilak Lake Road, though, is more of a worst-case scenario, every year turning to mush when the trees turn to green. This year has been so bad the Alaska Department of Transportation and Public Facilities closed the gravel road to all traffic Thursday for as long as conditions dictate, potentially up to a week. “It is very wet and very saturated in a number of places to the point where even four-wheel drives are getting stuck. Having vehicles try to get through the area, they’re creating huge ruts, that, a, they’re getting stuck, and then they’re destroying the road surface, so the whole thing is shut down,” said Shannon McCarthy, spokesperson for DOT. McCarthy said the plan was for maintenance crews to work on the road Thursday and Friday and reassess the situation Monday. The lower section of road, miles 19 to 8.5, was opened to four-wheel-drive traffic Tuesday. The upper section, Miles 0 to 8.5, remains closed, and the entire road is still closed to RVs and trailer traffic. “They got some dozers down there. First of all they filled in the ruts and then they leveled the road with a crown of course in the middle so if it can shed any water it will. And then time. They have to have the road dry out because if you let cars back in on a road that’s that wet they will just re-create those ruts, and of course ruts hold onto water really well,” McCarthy said. The 19-mile loop road off the Sterling Highways at Mileposts 58 and 75.2 accesses several trails, campgrounds, cabins and boat launches. And while May isn’t peak activity time for the popular Skilak Wildlife Recreation Area, the closure is having an effect. McCarthy estimates the road gets an average of 100 vehicles a day, as many as 200 in the summer, and as little as 25 to 50 in the winter. Keith Burton, from Utah, and Taryn Dixon, from Texas, are two of the more dramatically affected. They got to Alaska last week, planning on heading to their summer job at Alaska Wildland Adventures Lodge across Skilak Lake on Saturday. Instead, they couldn’t even head down the road to the boat launch. “We haven’t seen it yet,” Burton said. “I’ve seen what I saw on the Internet when I applied, and we drove out and saw the road closed sign, but that’s it,” Dixon said. They were making the most of their change in plans, since the road closure gave them the weekend to explore the central peninsula. “We like what we’ve seen so far, it’ll be a good summer,” Burton said. “I’m from flat Texas, no mountains no trees, no anything. I saw my first moose yesterday, so that was cool,” Dixon said.